Whether a clever IKEA hack, iconic minimalist furniture, or a colorful new office—we here at Domino aren’t short on inspiration. A favorite source is, of course, design blogs, where cool new spaces, renovation advice, DIY brilliance, and everything in between keep us checking back daily. And with so many talented creators out there, you are pretty much guaranteed to find someone who shares your affinity for a particular style. Not sure where to start on bookmarking your must-follows? Presenting, in no particular order, the interior design blogs that continue to inspire us on the regular—including the up-and-comers you need to know. Will Taylor’s affinity for color is nothing short of dazzling and his blog Bright Bazaar is a direct reflection of that passion. The travel-enthusiast is all about promoting accessible and modern design, which he seeks out through a vibrant lens. The power couple behind Young House Love has renovated more than their fair share of homes, yet the husband-and-wife duo shows no signs of stopping anytime soon. Follow along for inspired makeovers, total home renos, and a peek inside the Maryland-based family’s captivating life. At this point, Oh Joy is less a blog and more a veritable empire. Joy Cho has turned her graphic design studio of playful prints and vibrant hues into three successful books and a slew of product collections, ranging from a tile line to a range of disposable dinnerware to a capsule collection of stylish luggage. Still, her blog is still going strong as HQ for all her ventures, and we still love keeping up with her design tips and lifestyle guides. Okay, Historias de Casa is written in Portuguese, so you’ll have to translate it to read the stories (pro tip: use the Chrome browser and Google will translate automatically), but it’s worth it. The pair behind the Brazilian blog, Bruna and Paula, take us inside lovely, interesting homes, shops, and studios in Sao Paulo and beyond. Even if the narrative might get lost in translation, the images provide more than enough colorful, plant-filled inspiration that will make you want to move to Brazil, or at least channel the boho vibes in your own home (they offer some easy DIYs to do just that). Erin is a veritable small space expert, so the fact that her blog reading my tea leaves was named Domino’s 2017 Best Small Space Living Blog is really no surprise. Her blog combines all the best tips on how to style a tiny apartment with a commitment to promoting sustainability and conscious consumption. The Memphis-based interior designer and stylist runs a successful design business (Nubi Interiors) in addition to a playful blog where she shares everything from snapshots of her home renovations to her personal style. We are in love with Stephanie’s “global eclectic” home; one look at her blog and you will be, too. Her style is super colorful, full of worldly finds that you’ll actually be able to purchase via the “shop” section of her blog. She also has a slew of easy DIY projects to try out on your next rainy day weekend. Aiming to empower women through their homes, Emily Blanchard’s blog is dedicated to sharing her personal design journey. Check out Emily Everyday for helpful tips on things like where to buy the best vintage rugs as well as fun DIY projects. As the winner of our Best Interior Design Blog category in 2017, we have to include Amber in this list. Her cheery personality reads through every blog post, and her masterful grasp on the California-cool style always keeps us coming back for more. You might know our next blogger from her previous blog, Chic Little House, which she recently relaunched as Katrina Blair to encompass her new focus on sharing broader lifestyle content. In addition to her signature small space style tips, Katrina also posts articles on entertaining and travel. Another Design blog awards winner, chris loves julia is this renovation blog centered around husband-and-wife team Chris and Julia (surprise, surprise). Follow along as they undertake home improvement projects—plus don’t miss their podcast for a behind-the-scenes look at what it really takes to undergo extensive remodeling. You know Athena as the entertaining and chef extraordinaire behind the hit cookbook Cook Beautiful, but the blogger has her roots in design. 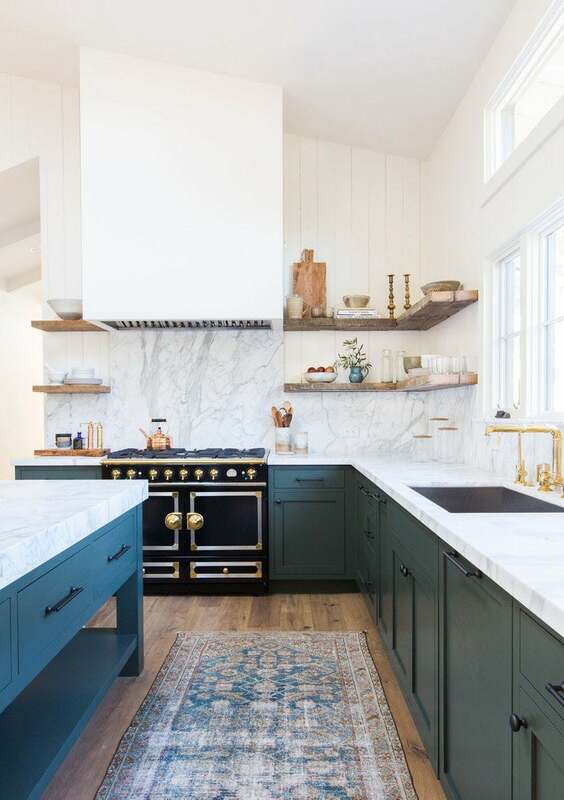 The decor section of her ever-popular blog is chock full of style inspiration and interior projects that you’ll be pinning for days. As the 2017 winner of our Best DIY Blog category, sugar and cloth obviously has an impressive catalogue of DIY projects. Seriously, Ashley has ideas on how to make everything from an abstract umbrella to fabric wall art. Also, there’s an entire section on her blog dedicated to macarons… which is something we can definitely get behind. For a down to earth approach to decorating, check out Ursula’s blog. The mom of three is an organization pro with tons of tips on how to indulge expensive taste on a budget. This up-and-coming blog is definitely one we have our eye on. An expert in both small space living and boho decor, Shavonda shares her signature style on her blog—as well as that of a few other similarly-minded design aficionados via home tours. She won our editor’s pick category for The Modern Maverick, and we can’t wait to keep up with the decor projects she has planned this year. And speaking of up-and-coming, we couldn’t not mention the winner of our Best New Design Blog category! Anita actually started her blog on Instagram, only recently expanding her platform onto a site that covers both a design blog and styling services. Her relatable voice makes her blog fun to read, and her mastery of the ever-trendy boho-California style is seriously aspirational. Our Best Lifestyle Blog winner for 2017, Sarah Gibson offers a wide range of content on her blog that spans everything from how to make the perfect cup of hot chocolate to the best wallpaper from Etsy. As she and her husband are currently renovating their second home, there’s plenty of firsthand design content, too. Fans of minimalist Scandi-inspired decor, you definitely already know Niki. But if you don’t, her blog is about to become your go-to for style inspiration: my scandinavian home is essentially a catalogue of Swedish style, complete with styling guides and an inside peek at Niki’s own home. It’s no surprise that it’s the winner of our Best International Design Blog award. Fashion-turned-homeware designer Jenni Kayne has already made a name for herself as the purveyor of simple, classic style, but did you know she has a blog as well? Rip & Tan is an insight into Jenni’s lifestyle, where the designer shares her favorite recipes, organization tips, and even some home tours. Medina is the winner of our 2017 Pinner’s Choice Award, which is fitting given that her blog is full of smart DIYs and upcycling projects that you’ve definitely seen (and probably even saved) on Pinterest. Go here for straight-forward tutorials and crafty hacks that even novice decorators can handle. This story was originally published January 30, 2018. It has been updated with new information.